House Re­pub­lic­ans emerged from an hour-long meet­ing Wed­nes­day even­ing no closer to a de­cision about how to fund the gov­ern­ment at month’s end while ad­dress­ing act­iv­ists’ con­cerns about chok­ing off fed­er­al fund­ing for Planned Par­ent­hood. In fact, with just eight le­gis­lat­ive days to go be­fore a gov­ern­ment shut­down, more op­tions ex­ist than be­fore, mak­ing it un­clear where GOP lead­ers will find con­sensus in their con­fer­ence. Lead­er­ship has been tout­ing us­ing the budget re­con­cili­ation pro­cess to tar­get fed­er­al fund­ing for the wo­men’s health or­gan­iz­a­tion. That has found some buy-in from some an­ti­abor­tion mem­bers who be­lieve that en­ga­ging in a fight that could end up shut­ting down the gov­ern­ment in the name of the an­ti­abor­tion cause could dam­age the move­ment. 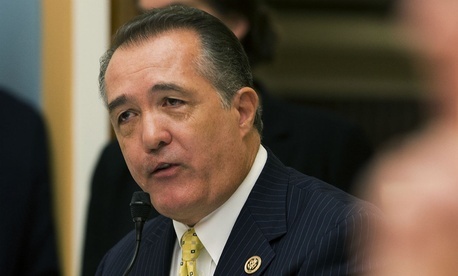 “I think there’s a pos­sib­il­ity that that could be true,” said Rep. Trent Franks, asked wheth­er a shut­down could set back his cause. “In this case there is po­ten­tially one oth­er man­euver that could work,” he con­tin­ued, re­fer­ring to re­con­cili­ation. Still, hard­line mem­bers of the House Free­dom Caucus showed no signs of let­ting up in their ef­fort to in­clude in a con­tinu­ing res­ol­u­tion a meas­ure that would at­tempt to strip fed­er­al fund­ing from Planned Par­ent­hood. Al­though the House will vote on a freest­and­ing bill that does so this week, the hard­line mem­bers think both that bill and re­con­cili­ation are dead-ends. They think that the only strategy to force Pres­id­ent Obama to sign a bill res­cind­ing Planned Par­ent­hood’s fund­ing would be to tie it to a must-pass spend­ing bill. The de­sire to strip money from Planned Par­ent­hood comes after an act­iv­ist group re­leased sev­er­al un­der­cov­er videos they claim shows rep­res­ent­at­ives from the group dis­cuss­ing the sale of fetal tis­sue. Planned Par­ent­hood claims the video mis­rep­res­ents what is a leg­al prac­tice of donat­ing the tis­sue for re­search. Still, oth­er mem­bers called for the con­fer­ence to scale back its am­bi­tions and tar­get the prac­tice in­stead of the or­gan­iz­a­tion. “We don’t care who’s do­ing all this hor­rible stuff, we just want it stopped,” said Rep. John Carter, an ap­pro­pri­at­or. He said the con­fer­ence dis­cussed wheth­er they could write bills crack­ing down on the sale of fetal tis­sue without singling out Planned Par­ent­hood. Mod­er­ate Rep. Charlie Dent offered an al­tern­at­ive to that ef­fect, which he said would put a morator­i­um on fund­ing to sev­en Planned Par­ent­hood clin­ics be­ing in­vest­ig­ated for al­legedly selling fetal tis­sue, in­stead of cut­ting off fund­ing for the or­gan­iz­a­tion across the board.